His name is Bernard von NotHaus, and he is a professed “monetary architect” and a maker of custom coins found guilty last spring of counterfeiting charges for minting and distributing a form of private money called the Liberty Dollar. Mr. von NotHaus managed over the last decade to get more than 60 million real dollars’ worth of his precious metal-backed currency into circulation across the country — so much, and with such deep penetration, that the prosecutor overseeing his case accused him of “domestic terrorism” for using them to undermine the government. Of course, if you ask him what caused him to be living here in exile, waiting with the rabbits for his sentence to be rendered, he will give a different account of what occurred. The story of Mr. von NotHaus, from his beginnings as a hippie, can sound at times as if Ken Kesey had been paid in marijuana to write a script on spec for Representative Ron Paul. At 68, Mr. von NotHaus faces more than 20 years in prison for his crimes, and this decisive chapter of his tale has come, coincidentally, at a moment when his obsessions of 40 years — monetary policy, dollar depreciation and the Federal Reserve Bank — have finally found their place in the national discourse. Increasingly citizens and their representatives are becoming suspicious of where their gold reserves are being kept. In the words of one of the petitioners Tom Lassing: “The last years have seen a loss of trust in the financial system and we have been fooled a lot. So I say: Just let the central banks like DNB show the gold is really there. Should the citizens committee be successful, we are confident they will discover the vast majority of the country’s gold reserves- 10th largest in the world at 612,000 kilograms, are held in the basement of the NY Fed. As we have been saying for years ago, the rig up: Central banks and too-big-to-fail financial institutions will not be able to hide the fact that they do not hold the gold they claim to. Is there really any gold left in Fort Knox? Lynnea Bylund is managing director of Gandhi Legacy Tours, Director of Gandhi Worldwide Education Institute, founder of Catalyst House and has nearly three decades of experience in administration, marketing and business development. She was a nationally recognized spokeswoman for the emerging alternative video and information delivery industries. She has a degree in holistic health-nutrition from the legendary and controversial health educator and activist Dr. Kurt Donsbach, she is the founder of two not-for-profit small business-based wireless trade associations and has lobbied on Capitol Hill and at the FCC where she has spoken out strongly against the cable TV monopoly, illegal spectrum warehousing and ill-conceived congressional schemes to auction our nation’s precious airwaves to the highest bidder. Ms. Bylund is a founder and former CEO of a Washington DC telecommunications consulting and management company with holdings in several operating and developmental wireless communications systems and companies. In 1995 Lynnea became the first female in the world to be awarded a Broadband PCS operating permit – she was one of only 17 winners, along with Sprint, AT&T, and Verizon in the biggest cash auction in world history, raising a whopping $8 billion. Lynnea also spear-headed the successful effort to launch the first cable TV network in the South Pacific islands. The Gold War Has Begun! Brace yourself for the impending gold shortage. Gold shortage? Yes. With the launch of a flurry of dedicated gold ETF’s last year, total ETF holdings of the barbaric relic, now exceed total world production. South Africa suffered its steepest decline in gold production since 1901, falling 14%, to a mere 232tons. It now ranks only third in global production of the yellow metal, after China and the US. Severe electricity rationing, a shortage of skilled workers,and more stringent mine safety regulations have been blamed. The world is running low on gold and here’s more reasons why. As the standard of living in China and India increases more and more people there will be demanding gold. As an example, the Chinese middle class has been increasing and although is a tiny percentage of the overall Chinese population it is still bigger than the entire population of the US now. The Chinese government is actively encouraging their population to buy gold. This is a lot of gold demand in China alone. The same is happening in India and their demand for gold is continuing to increase. This is on top of the extra demand by cautious and impatient investors who are not getting the results they expect from bonds and investments. The world’s biggest gold miner, Barrick Gold has noted that finding more and more viable gold deposits is becoming harder. 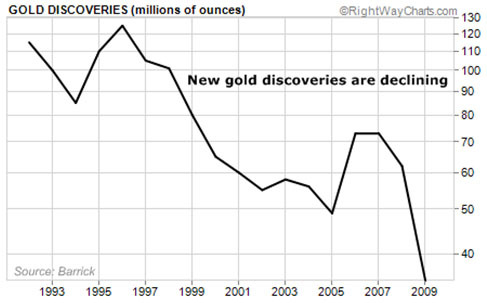 The chart above shows how gold deposit discoveries are rapidly declining and we know what that means. The value of gold, quite apart from the decreasing dollar, is going to go up as demand outstrips supply. You may be asking yourself, did the central banks ever control the gold market? Yes, indeed they did! In 2004 we wrote a series of articles in the Las Vegas Tribune questioning whether the world’s central banks were cooking their books regarding the amount of gold they held and why. * Much of our story told of the efforts of GATA, Gold Anti-Trust Action Committee, to expose the resultant gold-price manipulation that was occurring at the highest levels of the financial food chain. Now the Gold Anti-Trust Action Committee and its secretary/treasurer figure heavily in a new edition of the television program “Brad Meltzer’s Decoded,” which examines the question of whether the U.S. government really still has any gold in the vault at Fort Knox, Kentucky. The program, to be broadcast on the History Channel, stresses the secrecy and unaccountability of the government in regard to anything related to gold. Enjoy it here now. Lynnea Bylund is a director of Gandhi Worldwide Education Institute, founder of Catalyst House and has nearly three decades of experience in administration, marketing and business development. She was a nationally recognized spokeswoman for the emerging alternative video and information delivery industries. She has a degree in holistic health-nutrition from the legendary and controversial health educator and activist Dr. Kurt Donsbach, she is the founder of two not-for-profit small business-based wireless trade associations and has lobbied on Capitol Hill and at the FCC where she has spoken out strongly against the cable TV monopoly, illegal spectrum warehousing and ill-conceived congressional schemes to auction our nation’s precious airwaves to the highest bidder. U.S. govt out to make forms of bartering illegal? The U.S government may be positioning to establish private currency barter of any sort as an unlawful transaction, pursuant to a recent criminal conviction of Liberty Dollar’s founder Bernard Von NotHaus for “counterfeiting” and “conspiracy,” supposedly intending to illegally mint and replace US currency with a private one using silver and gold-based coins and silver-backed paper dollars. The federal government also is seeking to take permenant receipt of eight tons of silver and gold ($7+ Million dollars) bullion and silver ‘Liberty Dollars’ that were minted and sold by von NotHaus.